Leaving the harbour was nice and calm, but as soon as we hit open water, our small boat was thrown from side to side; the swells were not for the feint hearted but it would not be for long as we soon reached the islands. We were the first visitors that the islands had seen since the start of the season and the rangers looked pleased to see fresh faces. Being the start of May, the puffins were still on arrival to the islands, the breading season starts in May and ends in July. Guillemot’s, Shag’s and Arctic Terns were among the many birds on the islands, even though we were at the start of the season the birds were showing well! Our stay on the island was short lived, the sea was getting worse and our captain could not risk the safety of the boat. After 30 minutes on the island it was time to leave. Hopefully our next day would bring better weather. Driving to the boat the next day we could not believe it, the sky was crystal clear, what a change from the day before. As we climbed aboard the boat, our captain said “Told you better day today lad!, better day today!” The sea was remarkably calm and flat, our ride to the islands was amazingly smooth. Our first drop off was Staple Island, with over an hour on the island we were able to get great shots of the puffins and other birds. As the rain came down we moved off Staple Island and on to Inner Farne. In the height of the breeding season, as you make your way up from the shore to the top of the island, Arctic Terns dive bomb all visitors in defence of their nests, lucky for us this was not an issue. Walking around the island, Puffins darted in and out of their nests, heading out to sea to catch Sand Eels and bring them back to their mate. 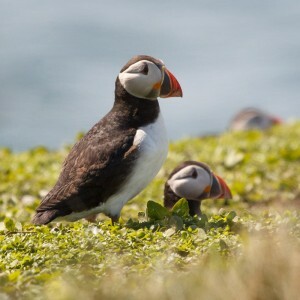 Due to bad weather this year, the Puffins have struggled to breed successfully and trips to the island have been limited. To follow the latest news from the islands check out the Farne Island Blog! The Farne Islands are a wonderful place to see a wide variety of the UK’s treasured wildlife.